Hughes, was an American statesman, lawyer and Republican politician from New York. He was the Republican candidate in the 1916 U.S. Presidential election, losing narrowly to Woodrow Wilson. He also served as the 36th Governor of New York from 1907 to 1910 Associate Justice of the Supreme Court of the United States (1910 to 1916), United States Secretary of State (1921 to 1925), a judge on the Court of International Justice, and the 11th Chief Justice of the United States (1930 to 1941). While there are a few name and photo buttons that are more common, most are quite scarce. 1.25 inch size jugates are very rare. The first lithograph buttons were produced in 1916. 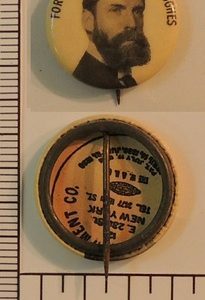 Around 300 varieties of buttons produced for BOTH Hughes and Wilson in 1916. 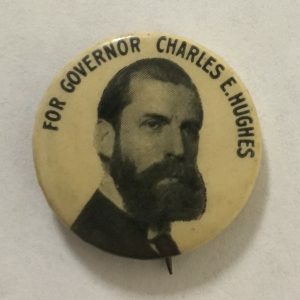 Hughes buttons were largely lacking in thematic designs.